It is Easter Sunday and Antonio is excited about his first communion. The other kids joke about eating God but Antonio feels solemn and excited about finally gaining knowledge of God. He takes and eats the wafer and waits for divine knowledge, but just gets pushed to keep the line moving. He asks God all the questions about unfairness and death that have been troubling him, but no answers come. He looks at the church's statue of the Virgin and feels empty. Antonio's disappointment in his communion shows that he had built up the event too much, hoping for a divine inspiration that would somehow answer all of his difficult questions about life, culture, and religion. This naïve hope is a reminder that he is still a young child, for all his maturity and experience. Cosby, Matt. "Bless Me, Ultima Chapter 19 (Diecinueve)." LitCharts. LitCharts LLC, 20 Nov 2013. Web. 19 Apr 2019. Cosby, Matt. "Bless Me, Ultima Chapter 19 (Diecinueve)." LitCharts LLC, November 20, 2013. 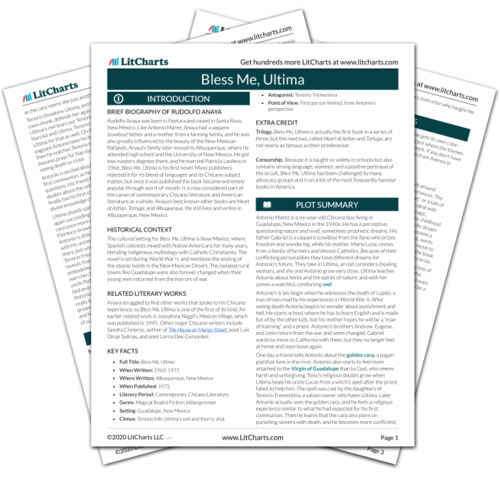 Retrieved April 19, 2019. https://www.litcharts.com/lit/bless-me-ultima/chapter-19-diecinueve.